The Garrison Border Town of Elvas and its Fortifications comprise a frontier town that was strongly fortified from the 17th to 19th century. It guards a key border crossing between Lisbon and Madrid. The fortifications are of the bulwarked dry-ditched type (“Dutch school of fortification”): as such it is the largest surviving example in the world. I liked Elvas tremendously: it's the authenticity and completeness of this fortified town that is remarkable in Europe in the 21st century. New developments have passed by, or at least are limited to the neighbourhoods outside of the city walls. Arriving here already is a spectacular experience: first you notice the enormous aquaduct, connecting the heart of the town with a water source in the far distance. Then it's time to tackle one of the four city gates - clearly made during times without motorized vehicles. I was thinking "This looks like a pedestrian gate, I shouldn't be driving here." But it was OK, although I caused a minor traffic jam when I wasn't able to release the handbrake of my rental car. The city streets are as narrow as the gates, so I was happy that I could leave my car behind at the hotel parking. I slept in one of the monuments by the way, the Hotel Sao Jao de Deus is located in the former military hospital. The town also still is very low-key. Like the other reviewer I found almost everything closed - churches, castle, munition depot. The uniformity of the townscape however is pleasant enough. I also walked across to the Fort St. Luzia, on the opposite hill. The gates were open and two men were working there. No ticket office however, and I just walked around on my own for a while. From here there are good views on the fortifications around Elvas. Today, the border between Spain and Portugal is hardly visible, but in centuries past, it was heavily fortified and fought over. There is a fair number of fortified border towns in both countries (some of them also striving for WH status), but the best one is certainly Elvas, guarding the approaches to Lisbon on the main road from Madrid and Badajoz. 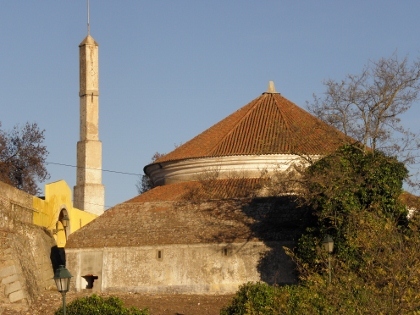 Fought over various times throughout the centuries (with the Spanish and Portuguese sometimes on the same side, as in the Napoleonic Wars), Elvas is a great example of military architecture. The town is surrounded by massive walls and has several huge forts outside. I spent quite some time in the biggest one, Santa Luzia, which also features a military museum. 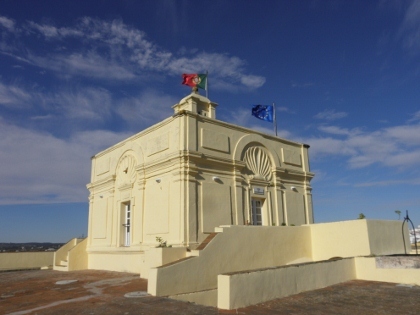 This fort and the castle of Elvas, dating from Arab times, both offer great views over the surorunding area and give an impression of the strategic location and importance of the town, which also features several interesting non-military attractions, especially the Amoreira Aqueduct and the beautifully decorated Dominican Church. 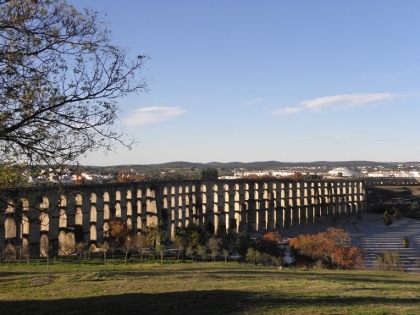 Elvas is definitely worth a day of exploration, and is conveniently located between Mérida and Évora. 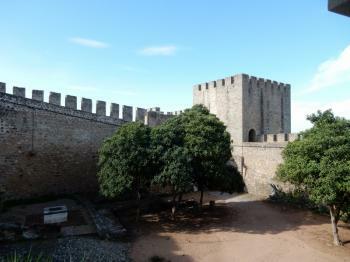 Can you imagine that being in Elvas you do not see this huge fortification that encompass the old part of the city? It happened to me when I get there at the end of December last year. 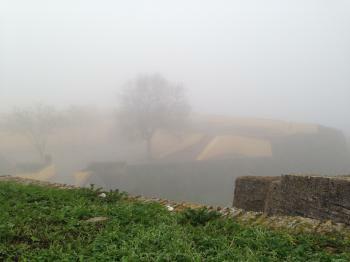 The fog was so dense that I even had some problem to find the way from the bus station to the city center and back. All I noticed that most of the fortifications were painted yellow, even the barracks and most military buildings from XVII century were painted in that colour. 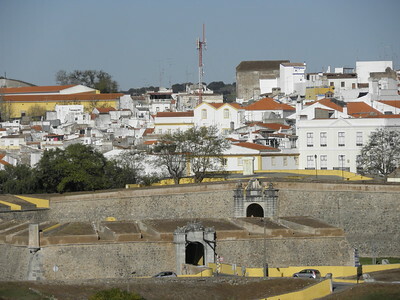 The oldest parts of the walls date from X century, but the strong fortification started being built in XVII c. You can walk around the city, passing by Castelo to the north, and Aqueduto da Amoreira to south-west. The only place I really enjoyed was the Iglesia de Nostra Senhora da Consolacao – a small church full of beaufitul azulejos. I visited this WHS in August 2014 on my way back to Spain by car. Most of the nearby villages or towns are heavily fortified being close to the border with Spain. In my opinion it's worth visiting Estremoz too if you have time. Let's focus on Elvas now. Elvas is really a hidden gem and indeed one of the best WHS Portugal has to offer. Having been inscribed quite recently it is in tip-top condition and still not many tourists visit. The main highlights are the Forts of Graca and Santa Luzia but the historic centre, the aqueduct and the other fortifications make a pleasant stroll. I'd love to visit again should I ever buy a camera drone to be able to see Elvas from above! By the way, if you want to try yet another bacalhau dish, go for the bacalhau dorado! You won't be disappointed. I just got back from Elvas on a day trip from Evora. At the moment, there are buses between Evora and Elvas, though few. I took the 9 am bus to Elvas and the 4 pm one back. The bus is the one that goes between Evora and Badajoz everyday. Everything seems to be closed today, or at least they only opened in the morning. It is a public holiday here. The streets were really quite empty but that suited me fine. There were also very few tourists. I managed to walk around the city along the walls or the ditches. The walls were well-preserved. I also walked around the Fort of St Luzia and the tiny Fortalice of St Mamede. I could not enter both either. The former was supposed to house a military museum, but it was closed. The latter seemed to me to be a private dwelling now and when I got close the dog inside went mad. The one thing I managed to get into was the tiny Church of the Dominicas. This used to be part of a monastery. The interior walls and covered with gorgeous azulejos. The aqueduct was nice too and very well-preserved. I think that Elvas can make a nice day trip from Evora. If only things were opened today. Better get there before it becomes another tourist hotspot! Sieges and Battles: Battle of the Lines of Elvas (1659), between Portugal and Spain. Extremadura Hotspot: Trains run to Badejoz and from there you can take a bus.